A cup of tea with a savoury snack- is the essence of a perfect evening. It’s the time when you sit back and relax with your family or friends, sipping tea. 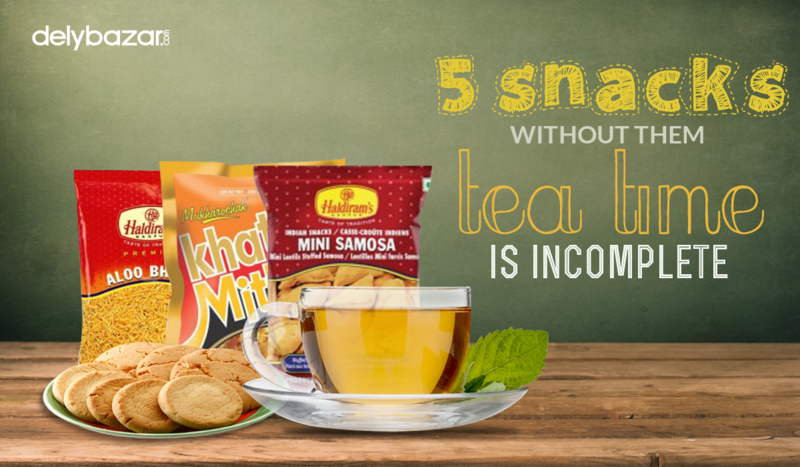 Tea time in India is incomplete without the tasty snacks to munch on. When it comes to snack, you will get a myriad of options to choose from. Tea and biscuits are an inseparable combo. There is no other way to enjoy tea than pairing it with a plateful of biscuits. This has almost been a ritual in every Indian household. Every time we have guests in our house, they are welcomed with steaming hot cup of tea and biscuits. Every Indian loves the softness of tea-dipped, mushy biscuits. Be it cream filled or salty, biscuits are an essential part of our tea-time. If you want to buy biscuits online, then visit our website. We have a wide range of biscuits and brands to choose from. For more details, click here. By whatever name you call it, a crunchy bowl of a spiced mixture is more than enough to make your tea-time delightful. Team it with puffed rice or muri and add a bit of onion and cucumber slice and this tea time snack is ready to seduce your senses. This is a potent mix of peanuts, sev, daal, dried grams, cashew and raisin, coconuts with a hint of other spices. There are hundreds of varieties to choose from. If you are diet conscious, you can go for a light and non-spicy mix. When it comes to having a filling snack with your evening hot cup of tea, nothing can beat a spicy samosa. Nothing seems more appetising than a combo of tea and samosa. Be it chilling winter evening or a typical rainy day, tea and samosa have turned into a staple snack of almost every Indian household. This tasty snack is available in almost every corner of the city. Usually it is filled with vegetables cooked with spices; however, you will also find samosas stuffed with paneer or minced meat. This is a tea-time snack relished by people of every age. The beauty of this snack is that you can get creative with it. It gives you a lot of scope for experimentation with a choice of vegetables and batter. Be it the humble beguni and vegetable chop or the tasty peyaji and alu chop- every street in Kolkata is dotted with stalls that provide you with this tasty treat. This addictive desi-version of cookie adds a unique flavour to the teatime. There is no better indulgence than teaming your cuppa with nankhatai. “Naan” in Persian means bread and “Khatai” is an Afghan word meaning biscuit. This translates naankhatai into “bread-biscuit”. So, what are you waiting for? Make your tea-times more savoury with these tasty tea-time snacks.